Many people have resorted to bottled water, which is expensive, inconvenient and environmentally unfriendly. Now there’s a better solution. Want to learn more about saving money by drinking better water? Call our Service Department at (302) 994-5786.
of integrity, dependability, and quality workmanship has withstood the test of time. 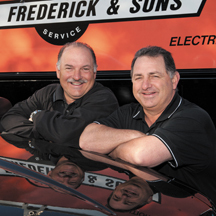 Our Service technicians, sales departments, and customer service representatives are a part of our family, sharing our family values and high standards of quality. We are confident and willing to place a warranty on all of our work and products, all of the times, no matter what. We employ NATE-certified installation and service technicians, which means we provide our customers with the very best service possible. Thank you for considering Joseph Frederick & Sons for your home’s air conditioning, electrical, heating, and plumbing and bath & kitchen remodeling needs. check us out on Facebook, or contact us at (302) 994-5786. We look forward to serving you! Your employee was very much in charge and in control of my renovation needs. I am quite impressed with how he led the project. He kept his crew well informed which bolstered my confidence and exceeded my expectations for a job well done.